hardcover, so very thoughtfully and kindly sent to me by the author and by her publisher. Thank you! I have never in real life met S.K. Rizzolo, but she is a member of a group I belong to on goodreads. I had heard of her work, of course, but when I spoke to someone named "SK" for the first time in the group, I had absolutely no idea that that "SK" was the author S.K. Rizzolo. Then at some point the light bulb over my head flashed on and I put two and two together. So, when she emailed some months back and said she had x amount of copies of this book, her latest in this series, to give away at her discretion and asked if I would like one, I was beyond honored. It's true that I don't normally find myself reading crime novels with a romantic edge to them; au contraire, I seem to be on a steady diet of dark, no-frills, edgy, psychological, existentialist-bent, noirish, largely obscure and downright gritty, no-holds barred (but always well written!) crime fiction. So, after having read several of these for a while, after having finished some even darker books that I've posted about on my oddly weird fiction page and some even more horrific (because they're true) nonfiction books, I figured it was time to give the old, tired, and probably by-now warped brain a rest. 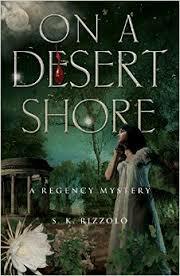 What better way than to relax with some light historical crime fiction? As I was looking forward to a restorative, ahhhh-this-is-going-to-be-just-what-the-doctor-ordered kind of novel, -- surprise! It turns out that Ms. Rizzolo isn't all sunshine and light: On a Desert Shore picks up some definite Gothic tones, there is an horrific crime at the heart of this book, and if that's not enough, there is also the issue of slavery that she weaves most deftly into her tale. In a nutshell, and just to whet appetites, this novel begins in Jamaica in 1796, with a very ill Lt. John Chase of the Royal Navy coming out of his feverish delirium. He had been nursed through the illness that had killed a number of others by a slave named Joanna, leaving him extremely grateful to her for saving his life. Chase eventually goes back to work for the navy, but suffers a sidelining injury. Once again recuperating, this time in Naples, he returns to England where he is offered work in Bow Street, to "stick a plug here and there in the crime that flowed through the city." Now, flash forward to 1813 -- Chase has been offered a job looking after the daughter of a very wealthy English merchant, Hugo Garrod, in the face of some strange events that have been occurring at their home. Hugo is also the owner of a Caribbean plantation where, unfortunately, slavery still exists. His daughter, in fact, was born to a slave mother, who turns out to be the very same Joanna who helped Chase pull through his near-fatal illness. Because Chase was never able to thank Joanna, and has always felt a great deal of gratitude toward her, he agrees to take the job. However, before he can get to the root of the strange happenings surrounding Marina Goddard, there is a fatal poisoning at the Goddard home. As the evidence begins to mount, Chase and his friends begin to realize that it all points toward the lovely Marina, but all of them are positive that she has played no part in the tragedy. Chase and the others find themselves working against time and against the cascading tide of events to prove her innocence before she faces a terrible fate. Yes, there are a few sweetish sort of romantic spots in this book, but seriously, to her credit unlike many authors I've read, this one keeps them to a minimum; no bodice ripping here. The story focuses way more on the crime, on the characters, on London itself, and then there's the issue of slavery. Despite having never read any of the books in the series that come before this one, I became quite attached to the characters in this book -- all of them flawed with sad or unique circumstances to overcome, making me wish I'd read the other novels. My personal favorite: Marina Garrod, whose Jamaican roots come back to haunt her, who had been brought to London by her father to give her a good life in a free country and to be raised among other young women of her class and status. She reminded me so much of another woman I'd read about from the same sort of circumstances, the very real Dido Belle, who had much the same sort of experience in her time. Despite the fact that the slave trade in the British colonies had been officially abolished in 1807, slavery still existed there, and there's a wonderful scene in this book that brings home how some of the products (in this case, sugar) used in the Garrod household continued to be slave produced. 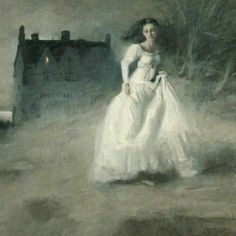 Then there's the Gothic aspect of this book -- I could tell by reading that the author absolutely must be a huge fan of the genre, especially toward the end, when it reminded me so very much of events in Wilkie Collins' Woman in White. I couldn't help myself -- my heart was pounding hoping the heroine would be rescued in time, just as I do when I'm engaged in any Gothic novel. There's also the incorporation of the exotic -- obeah -- that I just loved. I want to say that some of the writing also brought back mental flashes of old books my mom used to read and had laying around the house by Phyllis A. Whitney and Victoria Holt, stuff I just devoured as a preteen kid. That was a happy memory -- thanks! It may be a long while before I read something like this again, but I had a great time with this book. And, as it turned out, it was exactly what the doctor ordered. Aha! So this interest in mysteries came by you honestly from your mother. My father introduced me to Sherlock Holmes, Nero Wolfe and Perry Mason in my teens. I didn't know about this author or her books. But your mentioning Dido Belle reminded me that I saw, "Belle," which is a good movie about her and fairly recent. Partially from my mom. I started reading Nancy Drew at age five and never looked back. I'll have to watch the movie, Kathy -- I'm interested now! You could read at five? I started reading Nancy Drew at about age 10 and loved those books. I would visit a friend's house even when she wasn't home, and I'd sit in her room and read her Nancy Drew books. I think she started a lot of women mystery readers on the crime path. To be fair, I gave the Hardy Boys their fair share of reading as well. I could read at four.